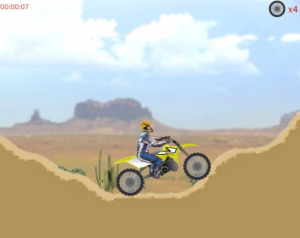 Motor Bike is a fun flash game from Addicting Games. 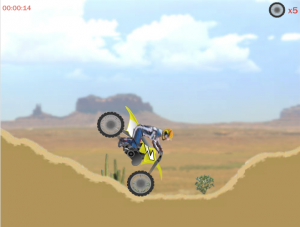 The point of the game is fairly simple, as you just need to try and stay on your bike while you traverse all the complicated terrain obstacles. The longer you play the game, however, the more fun you will start to have. Just like with Moto Racing Championship 2. Motor Bike game is built on a very straightforward graphics engine and that means the physics are also not too hard to figure out. To control your rider as he speeds through the levels, all you need to do is keep a couple of things in mind. There are four buttons that control different aspects of the character’s movement, and these can be used individually during gameplay or in combination with each other. The “up” button on the arrow keys of your keyboard is the most important button in the game. That is the way you throttle your bike, and without it you will not make it very far. When playing, you will want to have this button pressed down pretty much all the time as the whole point of the game is to build up and then keep your momentum. The “left” and “right” arrow keys are your tilt buttons. These are used for turning the rider either frontwards or backwards. An important thing to remember about these controls is that they do not follow a normal pattern of physics. As long as you hold down one of the left or right arrow keys the rider will continue to spin. The degree of the spin needs to be controlled by how long the button is pressed. One trick that you can use to make sure that you land your bike properly on the course is to keep your eyes on the ground. That way you are never surprised by the angle of the landing. Timing is everything. Another cool thing about the forward and backward tilt controls is that if you spin your character too far in one direction, you can always change directions in mid-air! Is that cool, or what? One button that you will not use very much is the reverse button. This is the “down” arrow on the keyboard. It does come in handy if you get stuck and have to back up, but you won’t need it very often. The maps are pretty good, but you need to have very fast reflexes to successfully beat the courses. The camera is zoomed in a little too close to see what kinds of obstacles are coming up, but it is still fun. The close angle actually adds to the excitement and keeps you on the edge of your seat. For a free flash game, Motor Bike is a very addictive game that is sure to please. Just think fast and you are good to go.